Japanese artist Yayoi Kusama has scattered mirrored balls inside a hurricane-damaged train garage on New York's Rockaway Peninsula, as the latest instalment in her 52-year-old Narcissus Garden series. 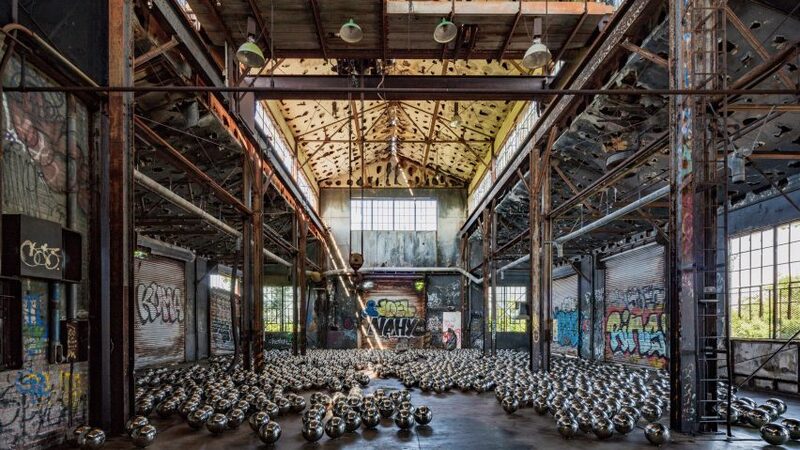 Kusama's installation is located in an abandoned industrial structure in Fort Tilden – an area that was designated as a US military base from the late 1800s until the 1970s. The structure was used as a train garage during this time but has since been left to ruin, and suffered further damage when Hurricane Sandy hit in 2012 like many other buildings in the area. The artist's intervention involved covering the floor of the space with 1,500 mirrored balls to reflect and contrast the rundown interiors, including graffiti-covered walls. Called Narcissus Garden, it is the latest version of a project that the artist first showcased at the 33rd Venice Biennale in 1966. She has also recreated the installation at other sites, including a pond at Philip Johnson's Glass House estate in Connecticut. Kusama was commissioned to create the artwork for Rockaway! – a biannual art programme established in 2014 to encourage redevelopment in the area following Hurricane Sandy. The initiative is led by Queens-based art museum MoMA PS1, the sister institution to the Museum of Modern Art in Manhattan, and backed by the Jamaica Bay-Rockaway Parks Conservancy, the Rockaway Artists Alliance and National Park Service. "Six years after Hurricane Sandy ravaged the Rockaways, the vulnerable area is still fighting for rebuilding and resilience," said MoMA PS1 director Klaus Biesenbach. Past installations for Rockaway! include German artist Katharina Grosse's colourful makeover of a condemned building on the beach in 2016, and a presentation of solo projects by Patti Smith, Adrián Villar Rojas, and Janet Cardiff in 2014. MoMA PS1, which recently unveiled an installation by The Dream Combine at its main venue in Long Island City, opened Kusama's Narcissus Garden for Rockaway! to the public on 1 July 2018. It will remain on view until 3 September 2018, alongside an exhibition of Rockaway! 's history in the Studio 7 Gallery run by the Rockaway Artists Alliance. The mirrored room also came to New York's David Zwirner Gallery in 2017, when it was showcased alongside Kusama's polka-dot installations.